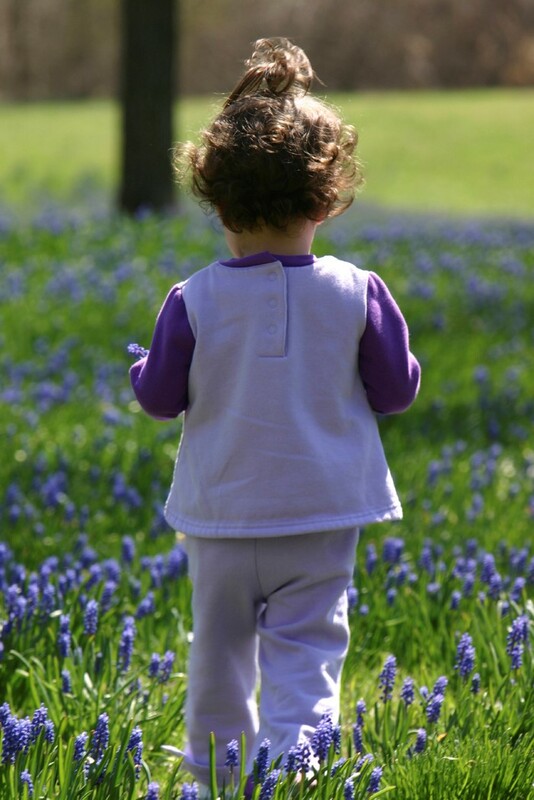 When you are studying and learning about posture as an adult, you can learn a lot from little people. 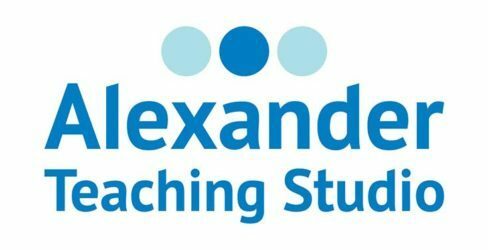 Most young children (ages 2, 3 or 4) illustrate beautifully the Alexander Technique concept of a central or primary coordination for the body. Put simply, the relationship of the head to the neck and torso has an influence over the rest of our body’s posture and movement. When this relationship is working well—when it is free, flexible and expansive—it has a positive influence on the rest of the body and our actions. When this relationship is not working well—when it is fixed, rigid and contractive—it exerts a negative influence on the body and our actions—basically it makes movement more difficult. So what are the key things that little people know that we can take away? 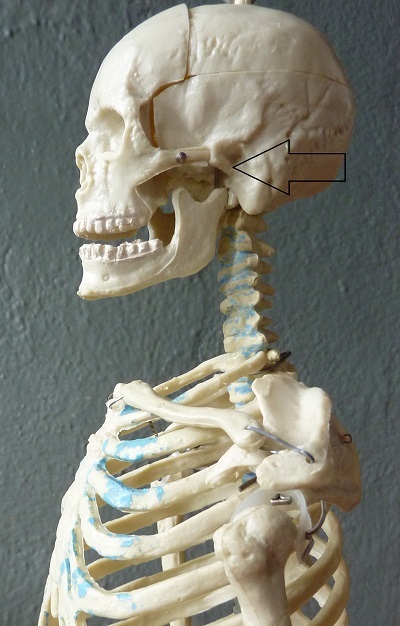 The Altanto-Occipital Joint is the joint where the head balances on top of the spine. It is very high up, between your ears more or less. Look at the side view of the top of the spine (the neck) and head below. Notice how high up the joint is (indicated by the arrow). Also notice how far forward the joint is. It is not at the back of the head, but in the middle more or less. Point your fingers towards each other at the level of your ear canals. Imagine a rod connecting your fingers (like a toilet paper holder). This rod would more or less intersect the joint. Roll your head forward and back gently (as if you are nodding yes) from this high up. Because this is where we nod from, I often call it the Nodding Joint. What do most little people do? They allow their head to balance easily at the top of the spine, using this joint to look down from, allowing their head to roll forward gently from the TOP of the neck. What do most adults do? When they look down, they drop from the BOTTOM of the neck and so take the head and neck forward together as a unit. 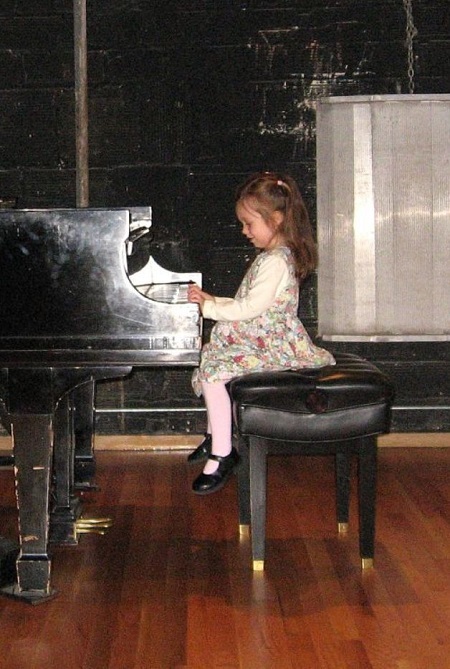 See how my friend’s daughter allows her head to roll gently forward from the top of the neck as she looks down to play the piano. 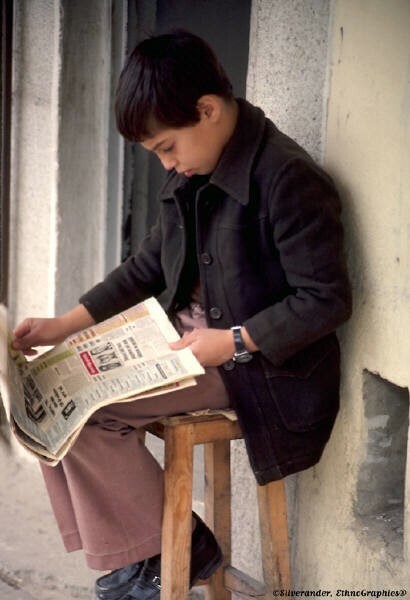 Contrast how the boy drops his head and his neck forward as he reads the newspaper on his lap. Take Away: Look down from the TOP of your neck, not the bottom of your neck. The Hip Joints are where your legs join your torso. Their ball and socket design permit a great deal of free movement. To locate your hip joints stand up, march in place and slide your fingers into the crease the legs make with the body in front. Your fingers should be pointing in toward the hip joints. In the picture below notice how far down the hip joints are. Contrast that with where you would indicate your waist, higher up. When they bend to pick something up or if they are sitting to come forward, they allow it to happen at the hip socket. This helps the back to stay long as they come forward. When they bend to pick something up or if they are sitting, to come forward, they do it higher up at the waist. Because the waist is not a joint (just a point between two vertebrae) it causes the whole spine to curve, shortening their back as they come forward. Notice how my friend’s daughter moves forward from her hip joints, maintaining a long back. Notice how I contrast both bending from the waist, creating a shortening through my whole head-neck-torso and folding at the hip joints, allowing for a more lengthened state through my head-neck-torso. Take-Away: Get familiar with your hip joints. Use your fingers to gently encourage a folding there when you go to pick things up. Usually we approach our toddlers as needing to be taught. But realize they can also teach you. Observe them. And imitate them. They instinctively know a lot! Excellent as always! And love the photos! Thanks. Hope to see you soon. You’re welcome Julie. The kids are great models for us–and darn cute too! Thank you for another excellent lesson! Teacher! I needed this. It’s been 10 years since my first lesson and the back problems that brought me to you are still gone. I’m so glad to see this blog. I need refreshment. So great to hear from you Kris! Glad to hear your back is still doing well. And very happy that my blog can help refresh you!